MSNBC on Friday broke two days of silence and issued a statement in support of Reid. People at the network said she will host her program as scheduled on Saturday, according to The Washington Post. In her statement, Reid said, "There are things I deeply regret and am embarrassed by (in her blog), things I would have said differently and issues where my position has changed. Today I'm sincerely apologizing again." She added, "I'm sorry for the collateral damage and pain this is causing individuals and communities caught in the crossfire. ... I've also spoken openly about my evolution on many issues and know that I'm a better person today than I was over a decade ago." In particular, Reid repudiated comments she made in 2006 that echoed a discredited conspiracy theory that the federal government was behind the terrorist attacks that killed nearly 3,000 people in New York and Washington. In another post in 2005, she appeared to agree with then-Iranian president Mahmoud Ahmadinejad that Jews should be forced to move from Israel to a colony in Europe. "God is not a real estate broker," Reid wrote in reference to Israel. "He can't just give you land 1,000 years ago that you can come back and claim today." However, Reid said on Friday, "There is no question in my mind that al-Qaida perpetrated the 9/11 attacks or about Israel's right to its sovereignty." 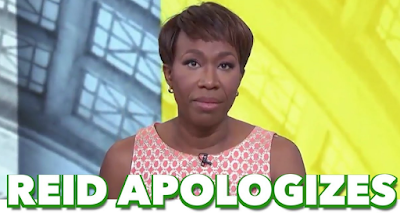 As criticism of Reid mounted this week, MSNBC faced a delicate decision - whether to fire the only African-American woman to host her own show or to stand by her as controversies over Roseanne Barr and Samantha Bee swirled at other networks. After two days of internal deliberations, the network's executives chose to side with Reid. Reid's apology was the third one she has issued for comments on her blog, written while she was a TV host in Florida starting in 2005. She apologized in December for old posts suggesting that then-Florida Gov. Charlie Crist was secretly gay and had gotten married as a cover. She also apologized to conservative commentator Ann Coulter for suggesting she was a man. 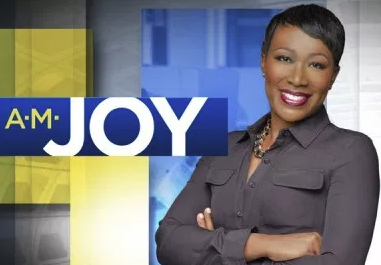 Meanwhile, The Hill reports Fox News host Sean Hannity defended MSNBC's Joy Reid on Friday amid scrutiny over newly surfaced blog posts of hers promoting conspiracy theories and offensive content, arguing that she should not be fired and that she be "given a chance to make it right." "It's good to see Joy (who is no fan of mine) starting to take responsibility for her past remarks," Hannity said in a statement. "My suggestion is that she follows up with the groups and people who she offended, and learn from all of this. Her apology should be accepted, and she should be given a chance to make it right and not fired." Hannity said he was trying to set an example by forgiving the "AM Joy" host.